I heard about this internship by attending the 2017 Accounting Career Fair. My favorite accounting professor, Martha Merritt, invited many reputable firms in the greater Atlanta area to the career fair and gave me the opportunity to sell myself. I spoke with and handed out resumes to several companies at the career fair, but the company that stood out to me that most was Novogradac. Attending the career fair was one of the best decisions I have made while attending the University of North Georgia. The internship was an incredible learning experience. The most valuable part of the internship was the opportunity to conduct both audits and tax returns completely from start to finish. 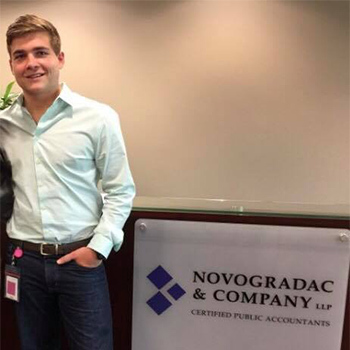 Most firms are divided up by their audit and tax professionals, but each and every employee at Novogradac must understand the nuances of both. They trust their interns to conduct the entire process from importing the trial balance all the way to completing the financial statements. This internship will give me a leg up in the future because I will graduate with not only a degree in accounting, but I will have great real life experience in a public accounting firm. This University and internship has given me the tools I need in order to be a successful accountant. Because of the knowledge and skills I have acquired at Novogradac in both audit and tax I will have an advantage over other professionals who may only be versed in one of these areas of accounting.